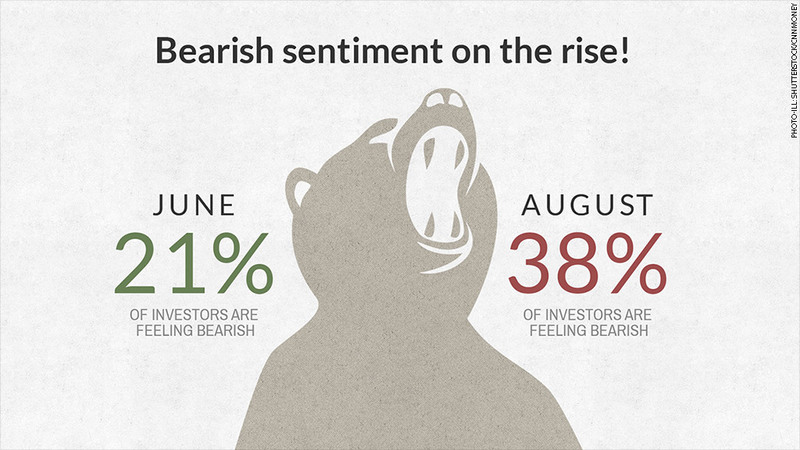 After hibernating all summer, the bears on Wall Street are suddenly very much awake. The Dow has lost 800 points since mid-July (about a 5% drop), and it's now negative for the year. Bears, the financial world's equivalent of severe pessimists, are feasting on scary geopolitical headlines. They think the stock market will continue to go down. The latest AAII sentiment survey shows that the percentage of individual investors who are bearish on stocks has climbed to the highest level since August 2013. "There's been a lot of choppiness. People see Gaza on TV and they freak out. They hear about ISIS and Ukraine and they freak out," said Michael Block, chief strategist at Rhino Trading Partners. So much for complacency: The palpable sense of fear on Wall Street stands in stark contrast with much of the past several months, a relatively quiet stretch of time. Only a few weeks ago, experts were warning about a growing sense of complacency. The mood quickly darkened -- and it's not just stocks that are flashing red. The yield on the 10-year Treasury, the "safe haven" on the investment world, tumbled on Thursday to their lowest level since June 2013. That indicates investors are buying more bonds. The CNNMoney Fear & Greed Index, which looks at seven indicators to gauge market sentiment, plummeted to an "extreme fear" level of 3 this week (only a 100 point scale). Consider that only a month ago, the index was a "greedy" 68. The percentage of bearish investors surveyed by AAII spiked to 38% this week from 31% the week before. That compares with just 21% as recently as June 26 and is above the historical average of 30.5%. While the markets shrugged off much of the geopolitical turmoil in recent months, that seems to have changed. Time to go bargain hunting? Still, the current turbulence could be a buying opportunity. Contrarians love to quote 18th-century British nobleman Baron Rothschild, who is credited with saying: "The time to buy is when there's blood in the streets." "I think this is a buying opportunity, particularly for longer-term investors," said David Lebovitz, global market strategist at JPMorgan Asset Management. "We need to keep in mind that Mr. Market can be fickle at times." Lebovitz and Block both said the AAII sentiment survey can be a bit of a contrarian indicator because it signals where the crowd is going, which is exactly the opposite of where the "smart money" should go. The rising bearish sentiment "shows guys are getting out of the pool," said Block. "Some of that dumb selling pressure could be alleviated. Those people could be forced to play catchup and get back in the game." The various geopolitical crises "haven't tripped up the bull because they haven't caused a recession. So the crisis-related selloffs have been brief, and good buying opportunities," Ed Yardeni, president of investment advisory Yardeni Research, wrote in a note to clients this week. Yardeni said a crisis that sparks a surge in oil prices would raise recession concerns, but he noted that hasn't happened yet and is likely not in the cards thanks to swelling U.S. oil production. Fundamentally strong: Lately there's also been reason to be optimistic on the state of the U.S. recovery. Labor market growth has been consistently solid in recent months, while second-quarter GDP bounced back to an impressive 4% pace after a weather-fueled contraction earlier in the year. Corporate earnings also remain solid, with second-quarter profits projected to be up by a healthy 10% year-over-year. "The primary reason I'm not overly concerned is that in the U.S., corporate fundamentals remain very strong," said Lebovitz. The question is whether that strong fundamental backdrop will get drowned out by the geopolitical fears the bears are currently seizing on.